St Patrick’s Cathedral the imposing twin spires of the Catholic Cathedral overlook the City on an elevated site. 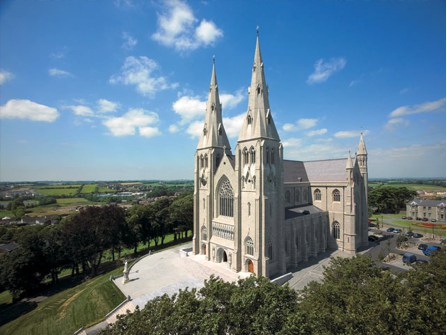 It was on this hill on the 17th March 1840 that the foundation stone for Saint Patrick’s Catholic Cathedral was laid by Archbishop Crolly. It was over 60 years before the Cathedral was completed, with consecration on 24th July 1904. County Armagh is one of six counties that form Northern Ireland and one of the 32 traditional counties of Ireland, situated in the northeast of the island and has a population of approximately 174,792. It is within the historic province of Ulster. The name “Armagh” derives from the Irish word Ard meaning “height” and Macha, together meaning place (or high place). Macha is mentioned in The Book of the Taking of Ireland. Emain Macha (now Navan Fort) once served as the capital of the Ulaid kings who gave their names to the Kings of Ulster.